The vertebrate brain is the large anterior portion of the central nervous system . The "cranial vault" of the skull encases the brain in most vertebrates. In invertebrates, the enlarged and specialized anterior ganglion of the central nervous system is often referred to as a brain, although not all scientists regard it as a true brain. A colored magnetic resonance imaging (MRI) scan of the axial section of the human brain showing a metastatic tumor (yellow). of the cerebrum, for information storage and retrieval, thought, emotions, and initiation of behavior. The mammalian brain has three primary subdivisions: the cerebrum (including the outer, wrinkled cortex), cerebellum, and brainstem. The brain-stem is further divided into the diencephalon, midbrain, pons, and medulla. The human brain is about 85 percent cerebrum, 11 percent cerebellum, and 4 percent brainstem. The human brain has more than 100 billion neurons , with 14 to 16 billion in the cerebral cortex and nearly 100 billion in the cerebellum alone. In addition, there are perhaps nine times as many glial cells, whose exact roles are unclear, but which help to support and maintain neurons. Most neurons are present shortly after birth, and as the brain continues to grow, the number and complexity of neuronal connections increases. These neurons are arranged into gray matter and white matter. Gray matter composes areas rich in neurons, their dendrites, and synapses. White matter is tissue rich in axons (nerve fibers), but with a few cell bodies or dendrites. It gets its color from an insulating wrap called myelin around the nerve fibers. The high lipid content of white matter makes it light and easily distinguished from gray matter in fresh, unstained tissue. The cerebrum and cerebellum each have a multilayered sheet of cells on the surface called the cortex, composed of gray matter. The white matter lies deep to this and consists of axons that send information to and from the cortex or connect different regions of the cortex to each other. Deeper masses of gray matter are also found embedded in the white matter. The central nervous system (brain and spinal cord) develops as a hollow tube whose internal space eventually forms a system of fluid-filled cavities called ventricles . The first two ventricles are a pair of C-shaped lateral ventricles, one in each cerebral hemisphere. Each of these communicates through a small pore with a slitlike third ventricle between the two hemispheres, surrounded by the diencephalon. From here, a slender canal, the cerebral aqueduct, passes down the middle of the midbrain and leads to a triangular fourth ventricle, between the cerebellum and the brainstem. Pores from the fourth ventricle open into a subarachnoid space that surrounds the brain. These ventricles are filled with a liquid, the cerebrospinal fluid (CSF), which also bathes the outside of the brain and cushions the organ in the cranial cavity. The CSF is secreted in part by a complex of blood vessels, the choroid plexus, in each ventricle. Around the brain and spinal cord, between the nervous tissue and bone, are found three membranes called meninges: the dura mater just under the bone; a middle arachnoid; and a delicate pia mater on the surface of the tissue. The brain receives most of its input from, and sends most of it output to, the spinal cord, which merges with the brainstem at the base of the brain. The twelve cranial nerves provide input and output pathways to and from the structures in the head. The cerebrum, the largest subdivision of the human brain, consists of a pair of cerebral hemispheres. Each hemisphere consists of an outer mantle of gray matter (the cerebral cortex), an extensive underlying of white matter, and deep aggregations of gray matter, the basal nuclei, or ganglia . Each hemisphere develops from a lateral outgrowth of the embryonic forebrain. Near its attachment to the forebrain, immature neurons aggregate to form the basal nuclei. As the basal nuclei grow, the remainder of the hemisphere continues to balloon outward and posteriorly, forming the cerebral cortex. This outgrowth is hollow, and its cavity becomes the lateral ventricle. In adults, the right and left hemispheres are separated from each other by a deep midline cleft, the longitudinal fissure, and are separated from the cerebellum by a deep horizontal groove, the transverse fissure. The hemispheres are connected to each other by a massive bundle of nerve fibers, the corpus callosum, on the floor of the longitudinal fissure. Many of these fibers connect regions of one hemisphere to corresponding points in the opposite hemisphere. The frontal, parietal, temporal, and occipital lobes are visible on the surface of the brain. The frontal lobe extends from the region of the forehead to a groove called the central sulcus at the top of the head. The parietal lobe begins there and progresses posteriorly as far as the parieto-occipital sulcus, which is visible only on the medial surface of the brain. The occipital lobe extends from there to the rear of the head. A conspicuous lateral fissure separates the temporal lobe, in the region of the ear, from the frontal and parietal lobes above it. The insula is a fifth lobe of the cerebrum not visible from the surface. It lies deep to the lateral fissure between portions of the frontal, parietal, and temporal lobes. The limbic system is a ring of tissue on the medial surface of each hemisphere, surrounding the corpus callosum and diencephalon and incorporating parts of the frontal, parietal, and temporal lobes. A major component of this system is the hippocampal formation, deep in the temporal lobe. Considerable knowledge of cortical function has come from patients with damage to specific cortical areas, and from electrical stimulation and recording from the cortex, often as a necessary prelude to neurosurgery. 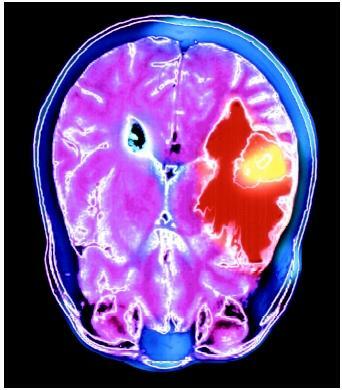 Imaging procedures developed in the 1980s and 1990s, such as positron emission tomography (PET), enable neuroscientists to follow changes in cortical activity over time. PET scans can show sequential changes in brain activity during such tasks as planning and executing movement and learning and storing information. Motor Areas. Four motor areas collectively occupy almost half of the frontal lobe. One of these, the primary motor cortex, is the precentral gyrus just anterior to the central sulcus. The motor areas are extensively connected to the basal ganglia and cerebellum. Working together in complex feedback loops, these areas are essential for motor coordination, postural stability and balance, learned movements, and the planning and execution of voluntary movement. Sensory Areas. Primary sensory areas receive incoming sensory information. One of these, the primary somatosensory cortex, receives input for pain, temperature, touch, and pressure. It is located in the postcentral gyrus, the first gyrus of the parietal lobe posterior to the central sulcus. The primary auditory cortex, for hearing, is on the super (upper) margin of the temporal lobe, deep in the lateral fissure. The primary visual cortex, for sight, is in the occipital lobe, especially the medial surface. Primary sensory areas are organized into precise sensory maps of the body. The primary somatosensory cortex, for example, has a point-for-point correspondence with the opposite (contralateral) side of the body, so that, for instance, the first and second fingers of the left hand send sensory information to adjacent areas of the right primary somatosensory cortex. Similarly, the primary visual cortex has a point-for-point map of the contralateral visual field. The primary auditory cortex has a tonotopic map of the cochlea of the inner ear, with different points in the cortex representing different sound frequencies. Association Areas. Once received by a primary sensory area, information is sorted and relayed to adjacent sensory association areas for processing. Association areas identify specific qualities of a stimulus and integrate stimulus information with memory and other input. To hear a piece of music, for example, involves the primary auditory cortex, but to recognize that music as Mozart or Elvis Presley involves the auditory association area just below the primary auditory cortex. The human brain differs from that of other primates in its large amount of association cortex. Association areas not only integrate immediate sensory data with other information, but are also responsible for human ingenuity, personality, judgment, and decision making. The posterior region of the parietal lobe integrates motor and sensory information. Damage to this region often results in neglect or unawareness of the contralateral side of the body and the space around that side of the body. This can be reflected in such oversights as forgetting to shave one side of the face or dress one side of the body. The degree of behavioral dysfunction depends on the specific areas of the brain that are damaged and the extent of the damage. Temporal lobe lesions often cause difficulty performing tasks that require keen visual discrimination. Damage of the inferior (lower) area of the temporal lobe may produce short-term memory loss, while damage of the inferior and anteromedian (front-middle) regions may cause long-term memory loss. Lesions in the prefrontal cortex (far anterior portions of the frontal lobe) may produce problem-solving deficits, inability to make informed decisions, unpredictable emotional states, and bizarre, socially unacceptable behaviors. "Left Brain" and "Right Brain"
The two cerebral hemispheres are neither anatomically nor functionally identical. Cortical functions are said to be lateralized when one hemisphere is dominant over the other for a particular function. The side containing the speech centers is called the dominant hemisphere, and is usually the left hemisphere. Most people are highly lateralized for language skills, and lesions in the dominant cortex can cause complete loss of specific language functions. The posterior, superior part of the dominant temporal lobe is important for understanding spoken and written language. Lesions in the language centers produce various forms of aphasia, difficulty understanding or using written or spoken language. The language-dominant hemisphere is also a site of mathematical skills, and intellectual decision making and problem solving using rational, symbolic thought processes. The nondominant hemisphere is more adept at recognition of complex, three-dimensional structures and patterns of both visual and tactile kinds. It is also the site for recognition of faces and other images, and for non-verbal, intuitive thought processes. Creative and artistic abilities reside in the nondominant hemisphere. Thus, the dominant hemisphere tends to be the more analytical one, and the nondominant hemisphere more intuitive. The basal nuclei, or basal ganglia, are four masses of gray matter deep in the cerebrum: the caudate nucleus , putamen, globus pallidus, and amygdala. Functionally related nuclei of the midbrain, such as the substantia nigra, are sometimes considered to belong to the basal nuclei as well. The basal nuclei receive nerve fibers from all areas of the cerebral cortex and are important in motor skills and processing a broad range of cortical information. Skilled motor tasks such as tying one's shoes—things learned and now done with little thought—are controlled by the basal nuclei. The brainstem occupies the base of the brain and includes the diencephalon, midbrain, pons, and medulla. Diencephalon. The diencephalon is a paired structure with right and left halves. The largest component is the egg-shaped thalamus, which relays incoming information from lower levels of the brain to the cerebral cortex. Little information reaches the cerebral cortex without passing through synapses (neural junctions) in the thalamus. Some information processing occurs here, but the thalamus functions more as a dynamic filter for incoming information. Immediately ventral to the thalamus is the smaller hypothalamus, the control center for the endocrine system and involuntary visceral motor system. The hypothalamus regulates diverse functions ranging from body temperature to gastrointestinal motility. All functions of the autonomic nervous system are regulated by the hypothalamus, although the hypothalamus can be overridden by input from the cerebrum; for example, in rage, fright, or sexual arousal. The hypothalamus also synthesizes the hormones released by the posterior lobe of the pituitary gland and produces other hormones that control the anterior lobe of the pituitary. The small epithalamus, containing the pineal gland, is posterior to the thalamus. One cranial nerve, the optic nerve (cranial nerve II), is associated with the diencephalon. Midbrain. 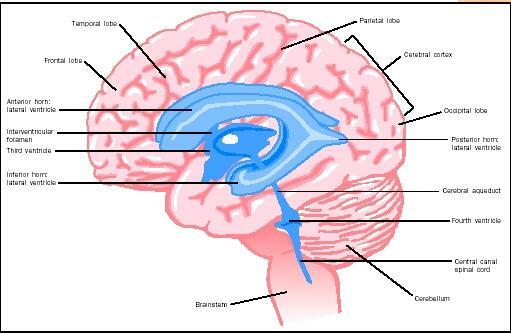 The midbrain is the smallest division of the brainstem. Four small humps, the two inferior and two superior colliculi, form the roof of the midbrain. They are involved in auditory and visual reflexes, respectively. Ventral to the cerebral aqueduct is a region of midbrain called the tegmentum. The floor of the midbrain is formed by two massive cerebral peduncles, stalks that attach the cerebrum and lower brainstem. The midbrain gives rise to two cranial nerves associated with eye movements: the oculomotor nerve (III) and trochlear nerve (IV). Pons. The most striking feature of the pons is a large, rounded, ventral mass, the basal pons, which relays information from the cerebrum to the cerebellum. The tegmentum of the pons lies between the basal pons and the fourth ventricle. It contains nuclei for several cranial nerves, although only cranial nerve (V), the trigeminal nerve, exits and enters the pons itself. Medulla. The medulla oblongata forms a transition from brain to spinal cord. Many columns of nerve fibers pass vertically through the medulla, going between the spinal cord and higher levels of the brain. The ventral surface of the medulla has a pair of ridges, the medullary pyramids, that contain motor nerve fibers carrying signals down to the spinal cord. Lateral to each pyramid is a mound, the inferior olive, containing neurons that relay information to the cerebellum. A central core of neurons, the reticular formation, contains control centers for the heartbeat and respiration. Three cranial nerves enter or leave the brainstem at the junction between the pons and medulla: the abducens nerve (VI), involved in eye movements; the facial nerve (VII), which controls the muscles of facial expression; and the vestibulocochlear nerve (VIII), which carries signals for hearing and balance. Motor rootlets of the hypoglossal nerve (XII) leave the ventrolateral surface of the medulla and supply muscles of the tongue. Dorsal to the olive are rootlets of the glossopharyngeal nerve (IX) and vagus nerve (X). The glossopharyngeal nerve is involved in taste, salivation, swallowing, and other functions. The vagus nerve supplies many organs of the thoracic and abdominal cavities. Inferior to the rootlets of the vagus nerve are those of the spinal accessory nerve (XI), which innervates several neck and shoulder muscles. The cerebellum, located beneath the occipital lobe and posterior to the medulla and pons, is an important regulator of motor function. It connects to the brainstem by three paired bundles of nerve fibers called the superior, middle, and inferior cerebellar peduncles. Integrity of the cerebellum is necessary to perform smooth, accurate, coordinated movements; to maintain posture; and to learn and regulate complicated motor patterns. Damage to the cerebellum does not produce muscle paralysis or paresis (weakness), but rather a loss of muscle coordination called ataxia. During the course of vertebrate evolution, the control of body functions other than simple reflexes has become concentrated in the brain. Neurons with related functions have become clustered in specific regions, and axons with similar functions have become bundled into discrete tracts. However, the primitive reticular formation of the brainstem is retained in even the most complex brains. More recently evolved centers and tracts have been added to this primitive core. Lateral views of four brains illustrate this evolutionary trend in vertebrates. The frog has a relatively simple brain. Its cerebrum and cerebellum are small, but its olfactory and visual centers are well developed. These centers trigger reflexive activity needed for survival. The alligator brain shows a growth of both the cerebrum and cerebellum without significant reduction of the visual or olfactory centers. The cerebrum and cerebellum are more developed in the goose, and the visual and olfactory centers remain well developed. These differences reflect higher levels of cortical function and more complex, coordinated motor functions. There is extensive enlargement of the cerebrum in the horse. Extensive cortical enlargement throws the cortex into gyri and sulci, accommodating a greater cortical area within the cranial vault. The cerebellum also is larger and more convoluted. Human brains have the most extensive cerebral and cerebellar development. The vertebrate brains have the same twelve pairs of cranial nerves, with the same functions. Burt, Alvin M. "Organization and Development of the Nervous System," "Brain Stem and Cerebellum," "Telencephalon," and "Cerebral Cortex." In Textbook of Neuroanatomy. Philadelphia, PA: W. B. Saunders, Co., 1993. Saladin, Kenneth S. "The Central Nervous System." In Anatomy and Physiology: The Unity of Form and Function. New York: McGraw-Hill, 2001. Multiple sclerosis is an autoimmune disease in which myelin degenerates. Inflammation of the meninges occurs in meningitis, which may be caused by a viral or bacterial infection. Imbalance between production and drainage of cerebrospinal fluid can lead to hydrocephalus, a potentially fatal disorder. Epilepsy is associated with unregulated electrical activity in the cerebrum. Parkinson's disease, due to degeneration of the substantia nigra, causes slowed movements and tremor. Biologist with dual U.S. and Italian citizenship who received, with Stanley Cohen, the 1986 Nobel Prize in physiology for her discovery of a substance ("nerve growth factor") that stimulates and guides the growth of nerve cells. During World War II, the Jewish Levi-Montalcini continued her research on the nervous system of chick embryos while hiding from the Germans. Spanish biologist who received, with Camillo Golgi, the 1906 Nobel Prize in physiology for showing that the nerve cell is the basic unit of the nervous system, a discovery that suggested how nerves could send signals to one another. Ramon y Cajal improved Golgi's silver stain, which revealed how the long threads (dendrites) of nerve cells connect to form a network.